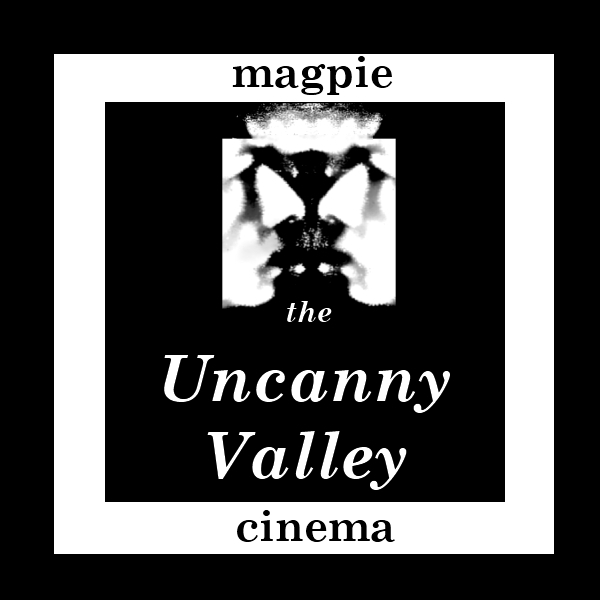 Uncanny Valley is organised by Magpie Cinema and runs as part of Hebden Bridge Arts Festival 2013. Kelly Loughlin trained as a cultural historian with interests in philosophy, media and visual culture. Having spent twenty years teaching in UK universities, she founded Magpie Cinema in 2012. Passions include film exhibition, film culture, contemporary art practice and community engagement; where there is film and an audience, there is cinema. Interested in short film, animation, contemporary art practice, DIY culture, cinema history and film exhibition as performance. Che Guevara John, Senior Lecturer in Creative Technologies at Leeds Metropolitan University. His career as a designer and programmer in the field of interactive technologies spans from the fledgling 80’s home computer game industry, time based media and re-active art installations to the development of terrestrial and satellite digital Interactive TV services for BBC, Sky & NTL. Through my practice & research into the moving image, experimental cinematic technologies and VJ culture, I have performed internationally, headlining events such as the Deadbeat festival, Playlouder at the ICA, Bestival Isle of Wight, Ministry of Sound (Asia tour), Creamfields, as well as residencies and exhibitions in and around London. Che’s areas of interest/research include Responsive Enviroments & Interactive Media, Software Literacy, Game Studies, Film & Future Cinema, Digital Video and Post-Production, VJ/Visual Culture. Mary Agnes Krell, Head of Media Practice and Senior Lecturer in Digital Media Practice, School of Media, Film & Music, University of Sussex. Interests in interactive rephotography and performative installation. Mary has worked widely as a digital artist (creating interactive media for the web, CD-ROM and installations) in the UK and internationally since the late 1980s. She worked with the Lee Miller Archive to develop, “Traces of Lee Miller”, a digital project exploring the WWII photography of Miller that toured the world with the Lives of Lee Miller exhibition. She has also been an associate member of Forced Entertainment as a digital author and, with them, created a number of interactive works that were exhibited around the world at venues including the ZKM (in Karlsruhe, Germany), the ICA (in London) and The Art Institute of Chicago. Nightwalks, an interactive virtual reality piece created in collaboration with the company won the Transmediale in 2000.